Well it has been a long long time since I played TSW, so I decided to remedy that issue. Plus, it is “golden week” so I am more efficient in earning ability points! According to the webpage, that ability stacks with boosts from the store so I bought one of those too. It’s a great game featuring questing and exploration, with the ability to train everything and switch classes on the fly. I resumed in Savage Coast, where I left off. In the grand scheme of things, I’m not very far along at all, something like 10/18 in the Savage Coast storyline mission, which is one zone out of newbie land. Now that the revamped new player experience patch is up, combat promises to be a bit faster. But the really nice feature was a map that displays mission locations. My currently active mission was for Daniel Bach in the Overlook Motel. It turns out demons and hell beasts and portals opened up on the beach, so I went to help fix that by slaying monsters and closing rifts. Once that was done, I followed the road and discovered groups of zombies feasting on corpses. The mission I took and completed involved burning 5 bodies, which of course were all surrounded by zombies. About this time, I decided to research some and change up my build. I had been using various starter decks, which were all pretty decent, but after a bit of searching I settled on a suggested build from the forums, the “Blade Fist Progression Deck” which has some nice features. It is flexible, with a bit of tanking and healing, an AoE impair (putting conditions on mobs is key and part of making skills decks is picking skills that synergize well: place a condition with one skill, exploit it with another). It builds up to more powerful decks which is nice – I know that with enough play, I’ll get enough ability points to learn all the skills… but in the meantime I’d like a little guidance so I can spend my ability points well. While building towards the final deck I can experiment a bit as well. TSW rewards the player that completes the suggested skills decks with a cosmetic outfit. For example, by learning the skills that make up the beginner “Trickster” deck, you unlock the corresponding uniform. So part of my motivation for learning the skills for the starter decks was to get a variety of outfits (all cosmetic) to wear, and also learn skills that were part of suggested decks. I do want to research and build my own skill combos, but starting out I also didn’t want to spend all my points towards a (temporary) dead-end. For now, I had enough skills unlocks to use most of the Blue Mountain Deck active skills – I believe I need to purchase Brandish and Surgical Steel, so those are what I will be saving ability points for. With my new skill deck, I went off to a creepy wooded area to destroy large insects (mission: The Exterminator). In the middle of this area was a treehouse – aha but I knew that because of the awesome new map which shows mission locations! – so I climbed up and grabbed another side mission, to kill some wandering named zombies in the amusement park to the south. On the way to the location for that mission, I ran across another one (Stranger than Fiction), which eventually led me to kill a monster roaming the park that was attacking people. Tier 2 of the quest is to investigate the lighthouse to the south-east. That’s where I left off… to return soon. Anyway, I do enjoy the interweaving of exploration and questing in TSW and ESO – both are similar in that you might run across another quest or two while out trying to finish another one, and both have quests that are multi-stage and update as you accomplish intermediate milestone. It has been a while since I played my Champion, Autumn, so I decided to move along in the epic storyline. I left off running errands for the crazy dwarf Nár, and wrapped up that book. After a bit of questing, I found myself at the Stone of Erech session play. Now, I’m not the biggest fan of session play. It’s nice for a bit of variety away from your character, but too much is annoying. For example, the Goblin starter area in WoW, it seemed like I was jumping in a vehicle or taking control of something else every 3rd quest. 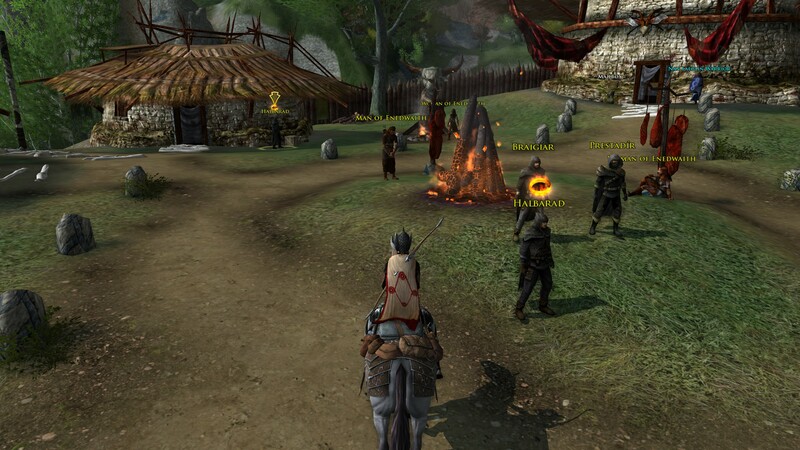 LoTRO handles it pretty well, since it often uses it to fill in some background information or expand on the story. In this instance, I’m alongside Isildur as he makes a treaty with the King of the Mountains, who swears an oath but breaks it. In between there is a fight where we clear out some orcs from a fortress – part of the oathbreaking as they did not aid against Sauron. In the third part of the instance, Isildur curses the men to remain undead until they fulfill their oath, so they go on to haunt the Paths of the Dead for 3000 years. Later in the books and movie, Aragorn calls on them to help in a battle against Sauron’s forces, and then releases them afterward (about 2:20 into this video) because they finally fulfilled their oath. I remember the scene in the books and movie, but forgot how the curse came about until “being there” (so to speak) in LoTRO. I think this storytelling and detail is fantastic. It may only appeal to fans of Middle Earth and associated IP/lore, but it is great none the less. LoTRO is the only MMO I’ve played where I’ve actually felt like I’m in the world itself, helping with tasks big and small. Most of the others make me feel like I’m using a graphical frontend to an optimized mob killing machine. That’s fun too, but I couldn’t even tell you what the story is in GW2 or WoW; it’s arbitrary and bosses are their to massacre for their loot. Actually GW did a good job, but due to heroes/henchman, it was somewhere in between a single-player RPG and an MMO for me. I spent half my time grouped with NPCs for the storyline, which I also really enjoyed. 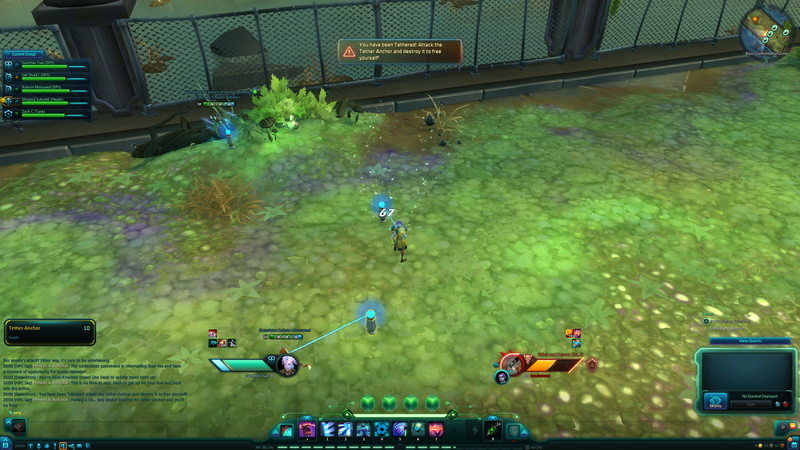 Wildstar… I’m not that far along to be too invested in the story. I’m in one of two factions fighting to control a new planet for its resources, and there is also digging into the mystery of a vanished technologically superior race, the Eldan. TSW has a good storyline too; I need to work that game back into my rotation. Anyway, after speaking to Nona, I had the funny situation of needing to speak to Halbarad in Lhanuch… both copies of him. This happens if you have both Vol 3 Book 3 Chapter 3 (Nona’s Request) and Vol 3 Book 4 Chapter 1 (Departure of Lhanuch) active. 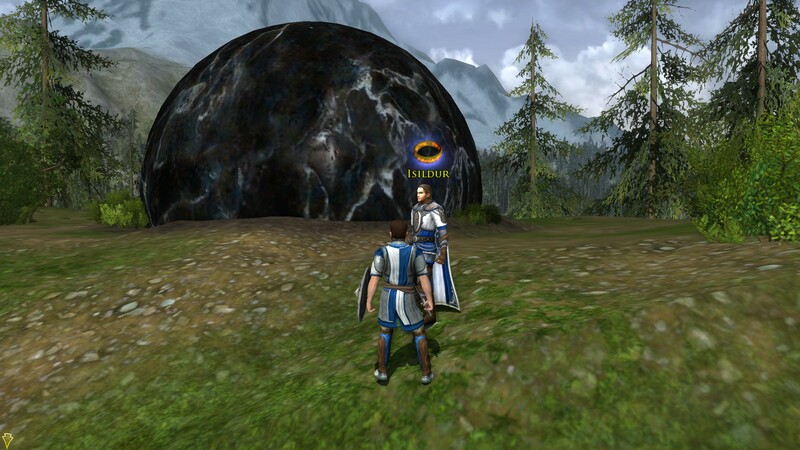 TL;DR – I haven’t had so much fun questing and adventuring in an MMO in quite a while! I created a Breton Sorceror and started playing through the tutorial. After exiting I went back from the mainland (Daggerall) to Stos M’Kai and had a ton of fun there. I enjoy the quests – they aren’t the usual “kill 10 rats” type of quests. Much like the single-player Elder Scrolls games, the quests are longer, usually have a few updates along the way, and focus on adventuring (explore the ruin and find the item; versus kill stuff and come back for another variant of collecting monster drops). For example, on Stos M’Kai you get a quest to rescue sailors that were shipwrecked and captured. There are three that need to be rescued, and you can don a disguise to reduce the number of fights along the way. After freeing them all, the quest giver wants to extract revenge on the kidnapper, and she winds up poisoning the leader and leaves. You have the option of administering the antidote (which I did) or not. Later at the quest end, the quest giver shrugs and says she doesn’t care because her crew was rescued, but adds that showing mercy means the possibility of more ships getting wrecked and captured. Interesting spin. 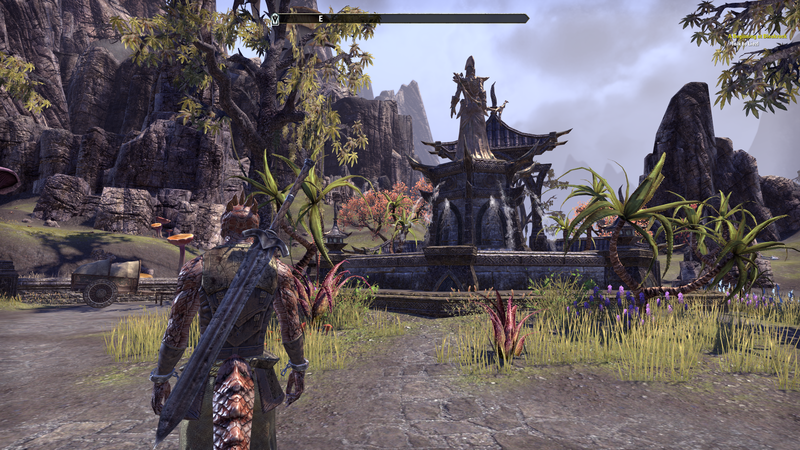 I also created an Argonian Templar and played a bit on Bleakrock Isle. There was a quest to investigate a bandit camp, with a disguise available to reduce the amount of fighting. As it happened, there were 2 or 3 other players attacking the bandits so I didn’t aggro any of them, even though I put on the disguise in an attempt to avoid some combat. I like quests that have checkpoints along the way and update goals as you go. When well written, it is as if new information alters the objective or adds a new one. Plus, the quests make sense in the context of the game. I’ve seen a few quests that allow for a bit of stealth, which helps move the focus ever-so-slightly away from being a mass murderer all the time. (Investigate 3 areas in the camp, potential to avoid combat vs. investigate 3 areas in the camp and by investigate I mean slaughter everyone). The worst kind of quests are ones that feel incomplete because the quest giver just wants part of the job done. To pick on WoW, although plenty of other MMOs have this exact same thing, take the Draenei starter area. Early on, maybe the 2nd or 3rd quest you get, you are asked to use your racial heal to save injured survivors. This quest probably exists just to teach players that Draenei have a racial heal skill. But the quest giver just needs you to save one survivor, out of the half dozen or more strewn about. Quest giver: Hey, we just had a shipwreck and we need to save any survivors! You there, can you help? Quest giver: Excellent, go out and save one victim. Player: Wait, what? How about the other 5 I also see dying of their wounds? Quest giver: Don’t worry about those others, I just want you to save any one of them and then you can do something else. I’d rather see a single victim to save… and ESO designs the quests this way. Rather than kill wolves until X number of doodads drop, it sends you to retrieve 2 items and if there are animals to fight along the way, so be it. But if there aren’t, just get the 2 items and the quest advances. And if 2 players are trying to pick the same thing up at the same time, let them both get a copy. Now the reality is WoW’s game engine is 10+ years old so if there is only one NPC to interact with, it needs to work when multiple players try to finish/advance the same quest. So if the engine can’t handle it (or wasn’t written to handle it and changing it is problematic), it is easier to add 10x NPCs to handle an influx of players. Because what is even faker is a line forming waiting for something to reset so the next player can step up. I mentioned earlier I enjoy following storyline, and a refinement on that would be that I enjoy doing quests that make sense. The quest type of “we’re surrounded by enemies! Go kill any 8 of them and you can move along to the next hub while we stay here perpetually surrounded, thanks” always struck me as artificial. Anyway, I am enjoying myself immensely. This game also looks gorgeous. My only (slight) negative is that I don’t enjoy the combat. But that’s true even in the single player Elder Scrolls games. I am terrible at bow and melee combat in these games, and can do OK as a ranged spell caster. The limited action set (1-5 plus R for an “ultimate” skill) makes for choices about which skills to advance and upgrade, and it appears that every class can increase every skill – although the ones for your class will obviously be easier to work up. The other odd thing is the game doesn’t seem to provide you with items for your class, even when starting out. For instance, at the end of the tutorial, I got a… sword (??) instead of a staff which would be more appropriate. And half of the quests reward things like shields or heavy armor – and I haven’t seen any quests with a choice of equipment as a reward. So I started as a sword-fighting sorcerer, but eventually received a staff and then bought another with earned gold. On the plus side, the combat system allows for every class (I’m assuming) to interrupt or block an enemy. If I left-click, I jab with my weapon, and a right-click raises to block. Clicking both button performs an interrupt (punching the weapon across the chest). Sometimes the enemy will use a crowd-control spell, and the game suggests hitting WASD to break it. The game actually displays hints for all of this during combat, so it is a matter of doing them quickly enough for the effect to occur. Kind of like WildStar, occasionally an NPC will charge up a skill and show a red AoE that fills up – when I see this happen, I try to move/dodge/roll out of the way. Or interrupt it. As far as melee or bow combat, maybe I just need to get more used to closing in on an enemy and mixing in mouse clicks with skill shortcuts 1-5. I rebound R to “autorun”, because due to 15 years of muscle memory, that’s the key I hit when I want to run. Not NumLock like the default seems to be everywhere. In turn, R was originally bound to the “Ultimate” skill, but I decided that “6” worked just as well instead, since the other skills you can equip are 1-5. And dodge wasn’t bound to a key by default, so I made it “B”, which was the default secondary bind for “inventory” – probably B for bags. I don’t need two hotkeys to open my inventory. 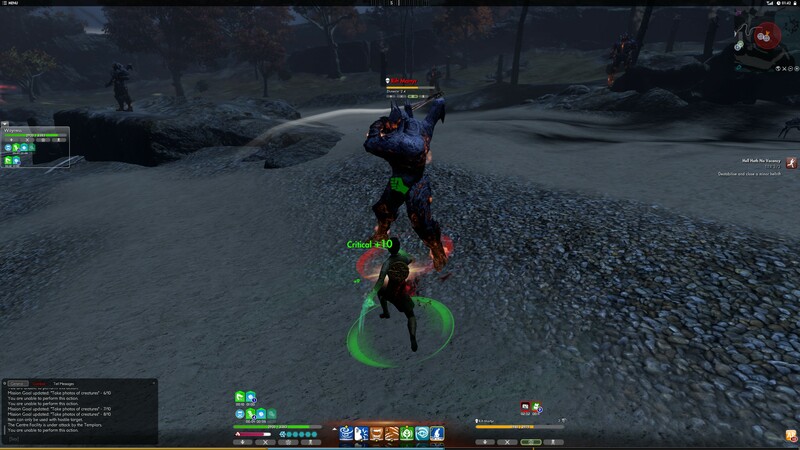 Combat as a sorcerer is approximately similar to other games. When I’m in range of an enemy, I can tab-target them and then start raining down my Dark Magic and Storm Calling skills. I also skilled into Daedric Summoning and have a familiar around with me to help attack – currently my familiar is an Unstable Clannfear. He’s pretty good about staying behind me, attacking my target, and in general being a low maintenance “pet” that doesn’t create more problems by aggroing a bunch of other mobs. This complaint about non-magic combat doesn’t detract from my overall enjoyment though, it is fairly minor and I may get used to it if I play a melee class more. A few weeks Jeromai asked about interacting with people and the extent of it, while gaming. I’m one of “those” mostly-solo MMOers, because I prefer and get player interaction with RL friends face-to-face via board gaming. Thus I never really sought out much interaction in MMOs, because random groups and disembodied voices are a pale imitation of actual interaction. Plus, after burning out playing Asheron’s Call, I came back to the genre with Guild Wars which had henchmen/heroes to help round out needing a full group of people. Not to say I haven’t been in great groups or guilds or even had long-term online friends via gaming. Of the games I play, the key draws for me are: storyline in two of them (LoTRO and TSW), plain fun and enjoyment in another (WildStar), and grouping in one more (WoW). I’m too inconsistent as a GW2 player to count it in my game rotation, but I’m mostly there to quest/explore and work along in the storyline as well. I do enjoy all the games and attempt to follow the story (as it is) in each, but let me say that as far as WoW goes, I’m there because I’m in a casual guild whose raid schedule works for me – and I have 2 coworkers that play… I wouldn’t be there for the storyline or questing otherwise. To get me in the mood to try ESO:TU, I restarted Skyrim. I got partway through on a swordsman and an archer, but both fizzled out because I didn’t enjoy (read: wasn’t good at) combat. So this next start I will go with a good old destruction mage, similar to what I played in Morrowind. The other thing I’m going to do is let my EVE sub run out. It’s a great game with many design features I like, but overall I’m not looking for what it does the best. I still have 6 weeks left since I pay in 3 month increments so we’ll see. In the meantime, I’m pecking away at Skyrim and recently defeated Mirmulnir. 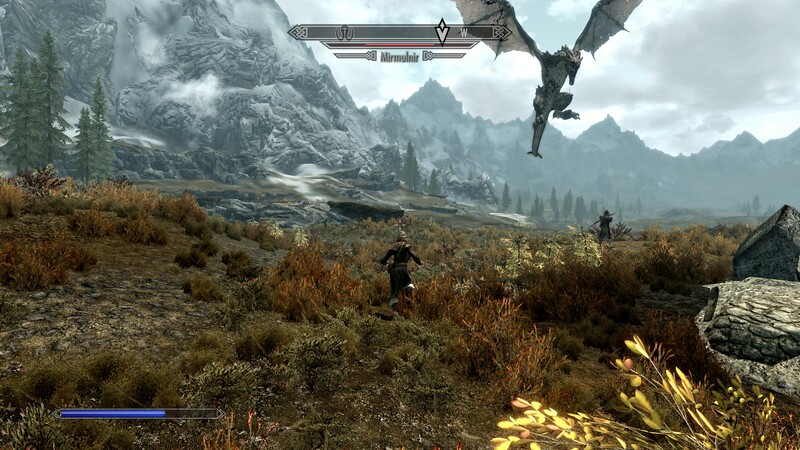 I absorbed the Dragon’s power when it was slain and am led to believe I’m “Dragonborn”. What I’m really hoping for is ESO:TU to go on a nice big sale tomorrow! Someone on Reddit put out a call for people to join a guild for newbies (or returning vets) so I responded. We got together one evening and 5 of us decided to check out the Protogames Initiative and the level 10 instance added recently. 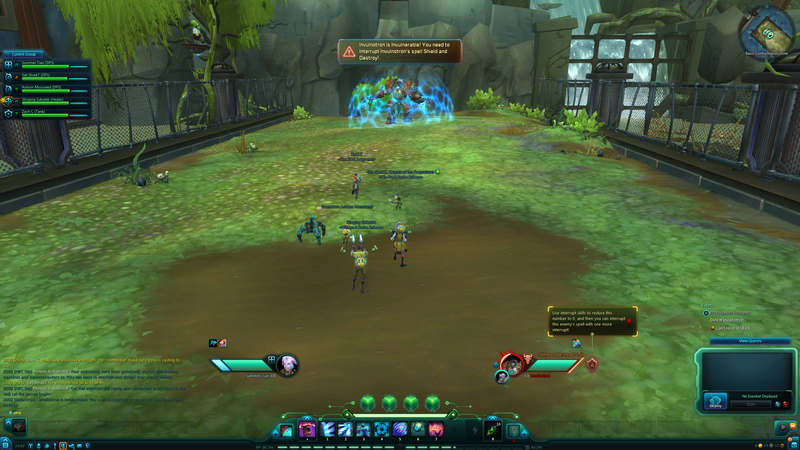 I had never seen it and was excited to check out grouping and instances in WildStar. All of us were above level 10, but the instance downscaled us to level 10, something I noticed when I moused over everybody in the group UI. 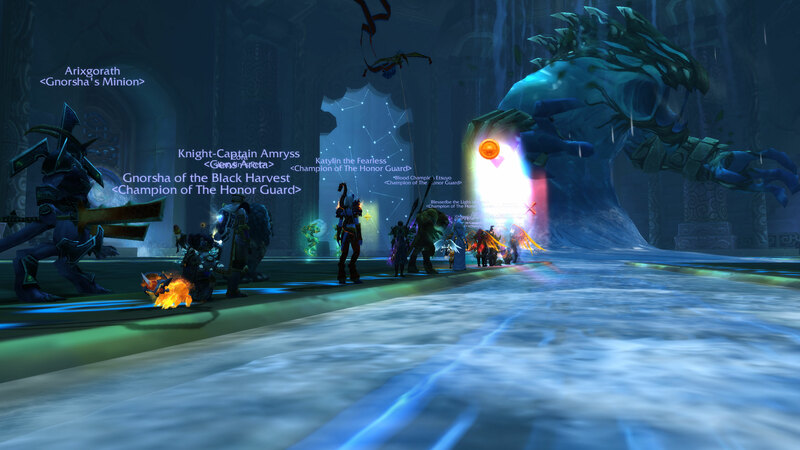 TL;DR – this was super SUPER fun, even though we wiped a few times. and that’s what was delivered. It was so fun 4 of us did it again, including me. Even better was that I got to try healing the first time and dps the second time. and then got a similar mechanic but the boss leaped across the room and we had to run, dodging flamethrower damage. I mixed my healing and dps screenshots from the two runs, since it was hectic and I didn’t always get the screenshot I wanted. I probably left out a fight or two as well. WildStar’s AoE skill system made for active, engaging, mobile battles, with dodging, jumping and aim required to keep the enemy in range for attacks and friendlies in range for heals. Even as a healer I had to fight in order to charge my class mechanic (actuators) in order to pop off my healing skills. And as DPS, my action set included an AoE healing skill (healing probes of some sort) so I did a reasonable amount of that too. The class felt more blended than other games, for example WoW, which separates the roles much more. 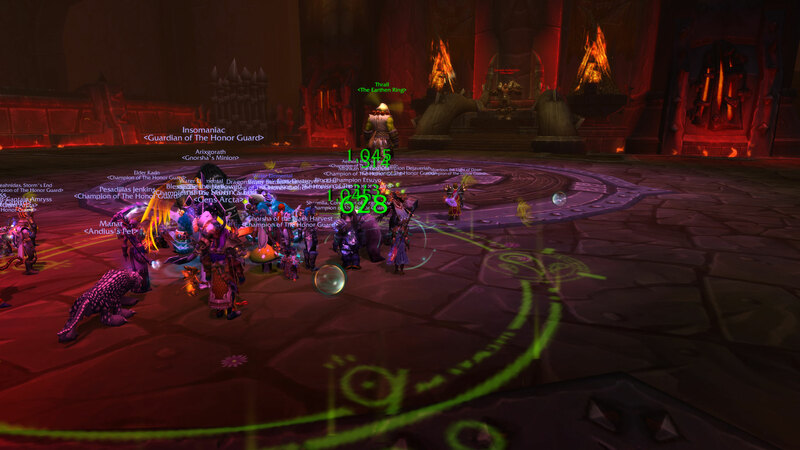 About the wipes… some bosses had a slowly charging skill that wipes the group if it finishes. This skill takes multiple interrupts to stop, perhaps even from multiple players depending on how fast a player’s skill recharges. We missed a few times, meaning not enough interrupts landed to stop the skill. This mechanic is reasonable and requires a little bit of coordination – mostly, bring an interrupt and use it; don’t depend on someone else handling the interrupt needs of the group. I also noticed a few bosses had “infinite interrupt armor” – that’s what the floating text said if you try to interrupt/stun them. 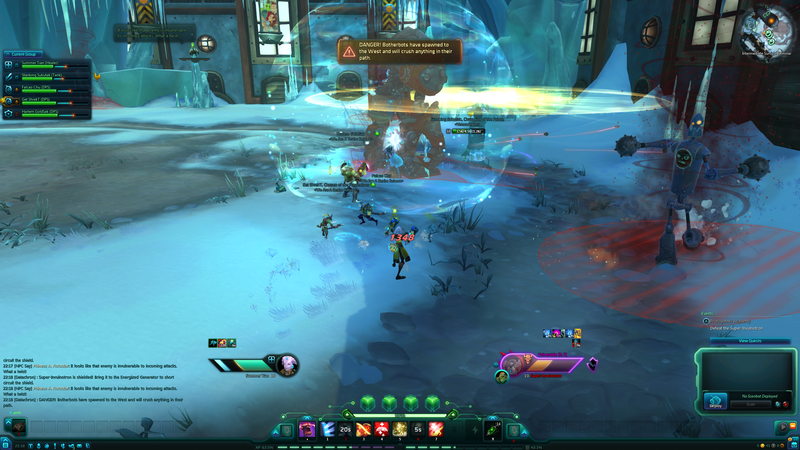 That mechanic is across many other games – the boss that is immune to player skill X – but WildStar is nice about telling you that straight up in the fight. When you see that text, go all out on attack and avoidance! There were a few other twists – boss knockback that made you drop your weapon. Not that it disappeared out of your inventory, but the weapon was represented on the field and you had to run over it to pick it up and be able to use your skills again. Along those same lines was the tether, a popup that kept you in range of it like an elastic band. It was simple to turn and destroy it in order to regain full motion. Anyway, I am looking forward to higher level instances. I had a lot of fun as healer and dps, keeping mobile and juggling the need to dodge enemy attacks while staying in range to use my own skills. How much time do you spend gaming each day or each week? I spend about 20 hours a week playing games… divided between board games and computer games. I’m a long time board gamer, starting in 1998, 2 years before trying an MMO. I don’t schedule meeting real-life friends and events ahead of computer gaming, so my computer game time is mostly confined to weekend afternoons and Mon evening – that’s when the WoW guild I’m in raids (the guild also raids Wed evening, but that’s a board gaming night and takes precedence. If something else comes up Mon evening, it will take precedence over the WoW raid). I do steal an hour here and there every day during the week, which is why themepark MMOs work so well for me. Especially ones I can solo decently in, or can drop in/out of easily, or have short easy-to-do tasks available (like Garrison upkeep in WoW), or do not feature significant PvP (battleground/alliance-battle style PvP is OK due to ease of joining/leaving. Anything more complicated means difficulty predicting how much time it will take). 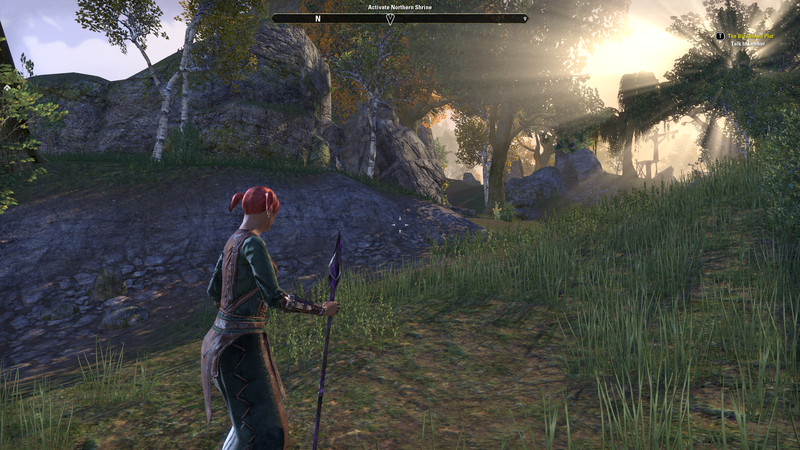 Essentially, sometimes all I have time for is advancing a few quests and then recalling to a safe spot to log off. I also have a bunch of games on Steam I like to play from time to time, and I fit those in whenever I have spare time because that’s easy to do for single player games. How many people do you roughly interact with while gaming, and what’s the extent of your interactions? For small board game night, 3 or 4. For big board game night, 5 to 8 and sometimes more. We also occasionally play trivia and then board games, because we’re near a board game cafe that has Thu night trivia. In computer games, well that varies a ton. I mostly solo due to time constraints. In WoW I raid once a week, so anywhere from 10-25, the FlexRaid system is pretty nice to allow a lot of variance in player numbers. In LoTRO, everybody else I know that plays has stopped, so it is just me at this point. Same in GW2, but that is an active game so I could probably join a guild if I wanted, including the one I was in back in GW – I did a server transfer to the server they play on, luckily for free back when they were balancing WvW stuff. I have a friend that plays TSW, but not so much anymore (and we also played GW and LoTRO together) and if I were more active I might try to find a small cabal to join. 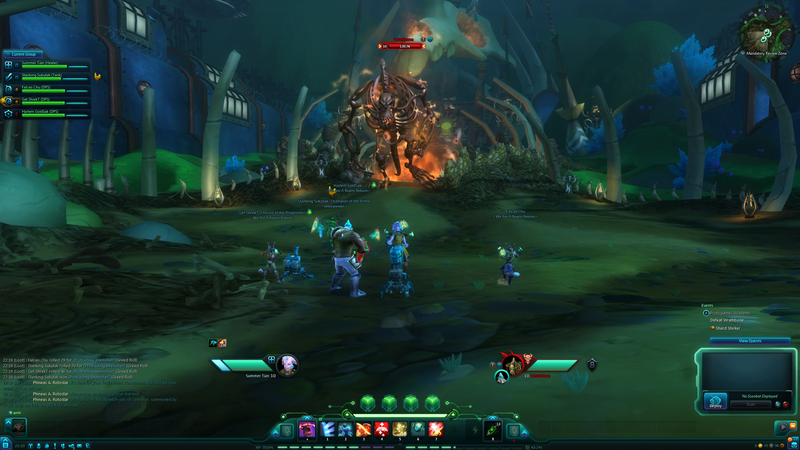 In WildStar, I joined a small guild of new players and returning vets and we had enough to do a 5-man instance, and it was huge fun. See tomorrow’s post. And then in EVE, I have 2 chars in a wormhole corp and usually only see 3-4 others on and nobody chats much, and I have my main char in Brave Newbies which is like a roaring hurricane compared to the quiet I’m used to. In summary – mostly solo with a few small group content (~5ish player) instances thrown in. 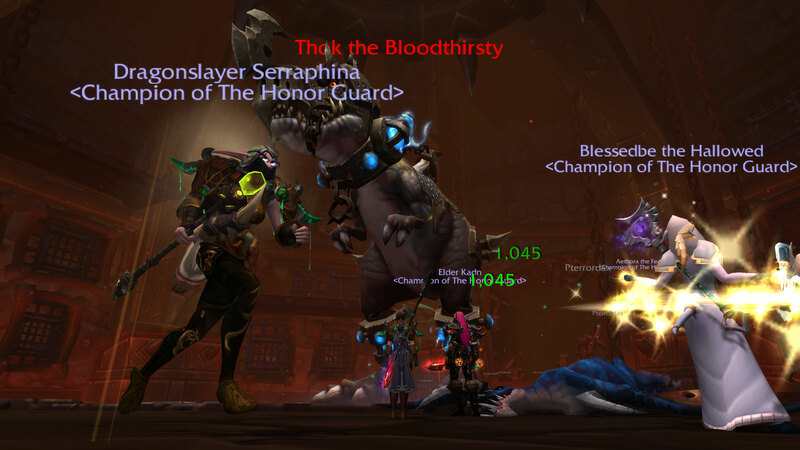 A weekly raid size outing, 10-25 in WoW and sometimes I’ll do LFR for fun. Huge numbers in EVE, except I’ve missed every call to defense since I’ve joined due to bad timing. What emotions do you enjoy experiencing while playing a game? A feeling I had fun, whatever I did was enjoyable and not tedious. It’s great to overcome some obstacle and advance (computer game), win a game or be on the winning team (board game), see something new/different or more of the story (computer), puzzle out or try different skill combos/builds (computer game – WildStar, TSW), learn a new board game, work towards a common goal (everything: computer, cooperative board game, trivia). What are some of your favorite genres/settings/worlds to read about in a book? I like sci-fi/fantasy, spy thrillers, and misc other non-fiction topics. I think Sanderson’s Mistborn world would make an interesting setting. It has a physics based magic system (burning/consuming metals for various effects) so the game version would require an economy with ore node harvesting not for crafting, but for powering skills. I’m not sure a spy thriller would make a good MMO setting – that would be more like a solo stealth-based game or RPG, such as the Thief series or Splinter Cell. What Warhammer 40k army would you choose (assuming unlimited budget)? I have to punt on this, I don’t know much about Warhammer 40K so my answer would basically be a coin flip. Geez, I googled Warhammer 40K and looked at their website. Not a coin flip, more like a d20 roll. Still have no idea. ASCII art, yea or nay? Overall all, nay. I recognize that some ascii art is creative and impressive working within the limitations of the medium. All the same, I’m not seeking it out to admire. I suppose I’m neutral on it. My most loathed one is brussel sprouts. Ugh. As for favorite… there are many I like, but my favorite are green beans. Unlimited budget, pick one country in the world, that you haven’t been to, that you’d like to visit. There are countries I’d like to revisit on an unlimited budget. But for a country I haven’t been to, that would be Egypt to do history/archaeology tours, and on my unlimited budget 😉 do some desert camping/caravan adventure. I usually pick a non-human when possible and I do like short races. In LoTRO, I like Hobbits. In GW2, I like Asuras. 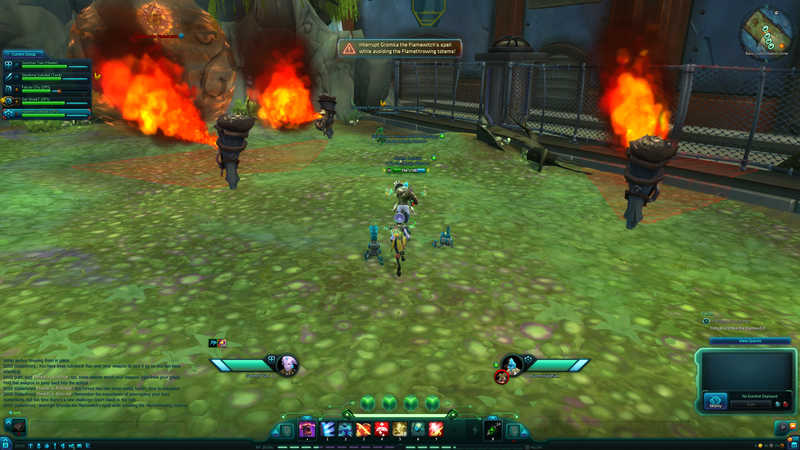 In WildStar… well the Chua look decent but I like the looks of the Granok and Mechari much more. In WoW, I like the Draenei (a tall race, another exception) and Gnomes. But overall I like the look of the Draenei better. TSW and EVE have human characters only. I like the Hobbits especially in LoTRO because of the occasional size mismatch. My highest level character is a Hobbit guardian and I love the size mismatch when fighting a troll or something large and I’m swiping at its legs. What I don’t like are excessively cute characters. I can’t explain it better, this would just be lumped in with personal aesthetics and what I like in an avatar which is difficult to describe fully. As an example, if I were to start playing FFXIV:ARR, I would probably choose a Roegadyn. The cat people (Miqo’te) and the child race (Lalafell) are just straight out of consideration for me, the Hyur appear to be the human race, so that leaves it between the Roegadyn and the Elezen. So in this game I’d be a tall race. Another example: I dabbled in Allods Online and rolled a Gibberling. 5 mins later I decided I hated the looks of the char so it was gone. All the other non-human choices were large or bestial. No wings for me, I don’t like the look. Back in GW1 I specifically chose Istani armor for my paragon because it was the least wing-like. I’m behind the curve in GW2, I’m not even sure what cosmetic armor is depicted.